If someone observed an average day in your life, how would they see you spend your time? 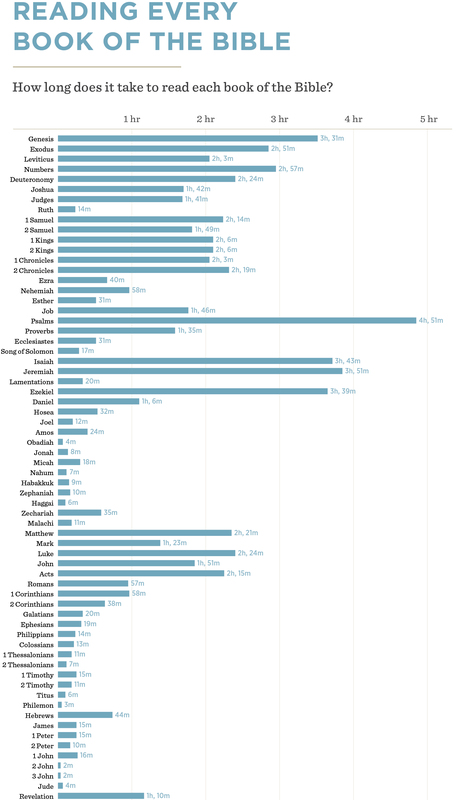 How much of your time is given to TV, Facebook, YouTube, podcasts, hobbies, and housework? 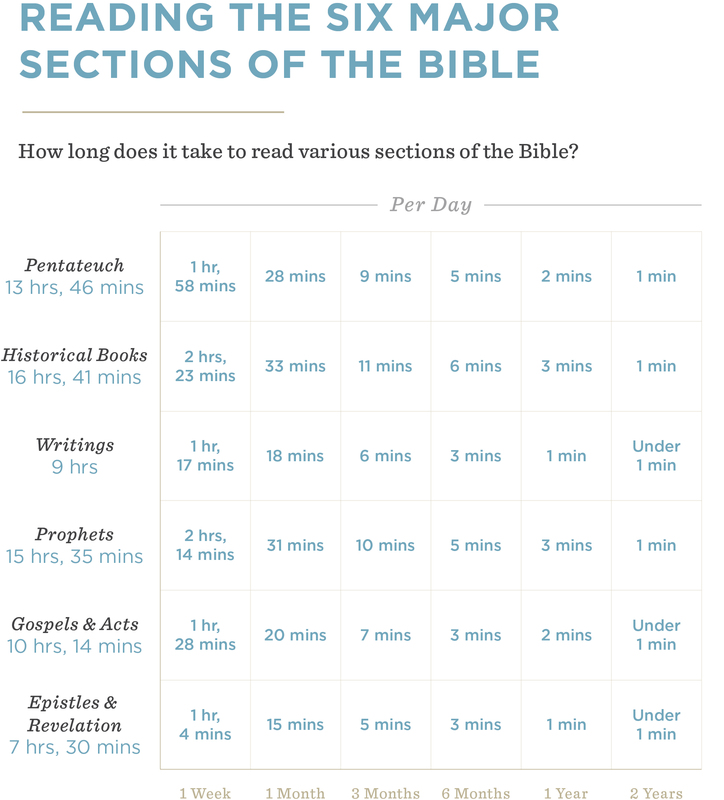 How much time do you devote to Bible reading? In August 2018, we surveyed over 11,000 readers, asking questions about how much time they spend doing some of the things mentioned above. We then compared those responses with the average amount of time it takes to read various portions of Scripture. See what we discovered in the infographic below. Do you have a spare 5 minutes in your day? Take up and read the book of Jude or maybe even Obadiah. Do you have 15 minutes? Read Ruth or Philippians. Do you have an hour? Immerse yourself in Nehemiah or Romans. 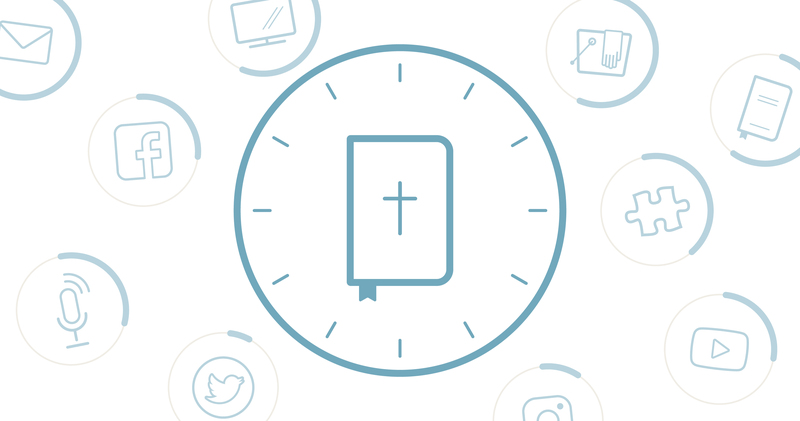 In just 12 minutes per day, you could read the whole Bible in a year. Does that still feel a bit ambitious? 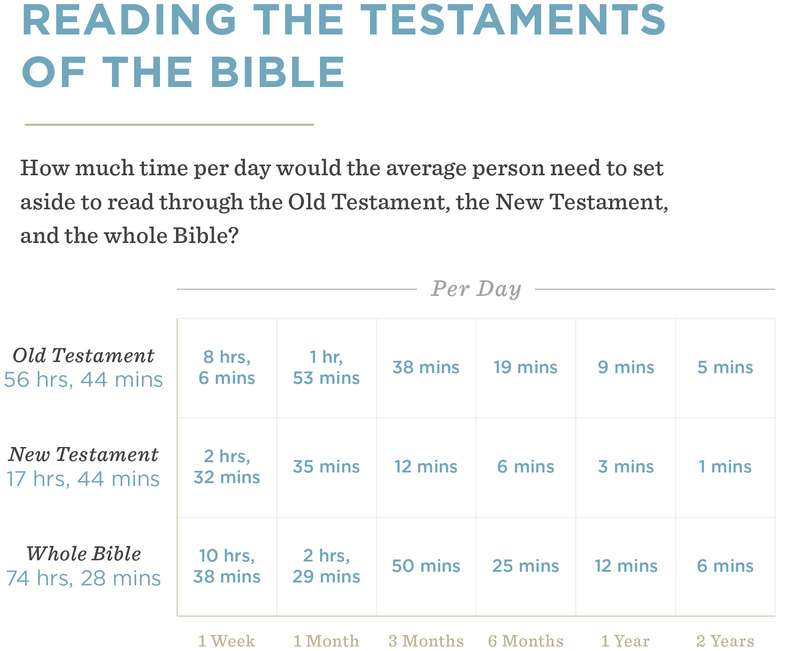 In just 6 minutes per day, you could read the entire New Testament over the course of 6 months. Whatever your pace, the point is to make daily Bible reading a habit. You'll be surprised by how much you can read over the course of a relatively short period of time! It takes about 10 hours total to read all four Gospels and the book of Acts. If you spend 20 minutes per day, you could read all 5 books in just 1 month. It takes about 15 hours to read all of the Prophets, from Isaiah to Malachi. Spend just 30 minutes a day reading the Prophets, and a month from now you will have finished all 17 prophetic books. What other patterns can you find? While none of these types of media is inherently evil, they do tend to take up our time and energy in ways we don’t anticipate. As you look at the list of activities, which stats are true of you? 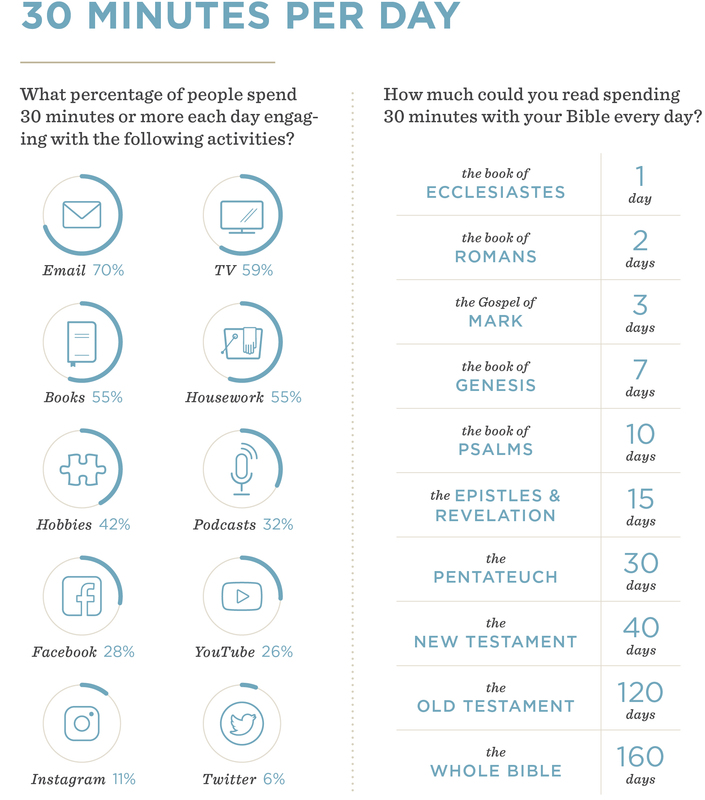 In what areas could you cut back in order to make more time for Bible reading and prayer? It’s remarkable what we would be able to accomplish if we consistently set aside even just a small amount of time each day for focused Bible reading. Imagine how our lives personally—and the church corporately—would be impacted by Christians reading the entire Bible over the next year! 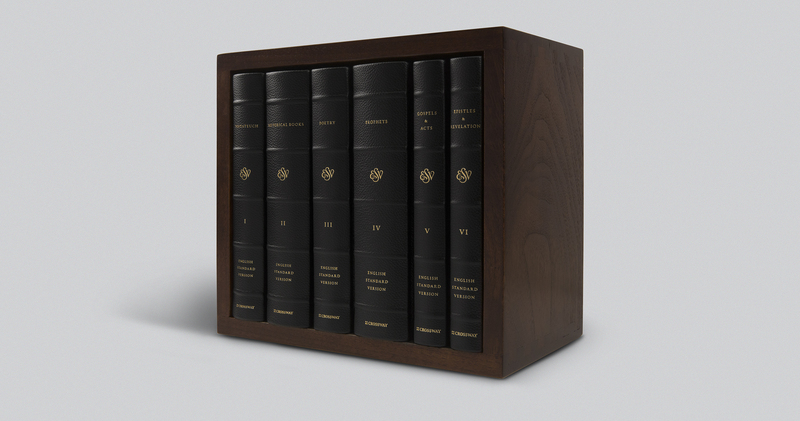 The ESV Reader’s Bible, Six-Volume Set was created to facilitate the best Bible reading experience possible. Printed on European book paper with a smyth-sewn binding and packaged in an elegant slipcase, this edition features a single column of Bible text that is free of all verse numbers, chapter numbers, and footnotes, as well as most section headings—resulting in a unique, distraction-free Bible-reading experience that helps God’s people encounter and delight in the beauty of God’s Word. Available in both a cloth over board edition and a premium cowhide over board edition in a solid walnut slipcase, the ESV Reader’s Bible, Six-Volume Set is a great option for those eager to jumpstart their daily Bible reading or looking for a meaningful gift for a friend or family member.